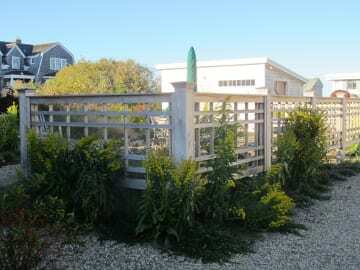 At ELA’s 2014 Season’s End Summit, Laura shared the transformation of a barrier beach landscape from open turf and over-sized driveway to a private and protected retreat. Here she steps us through the landscape restoration. 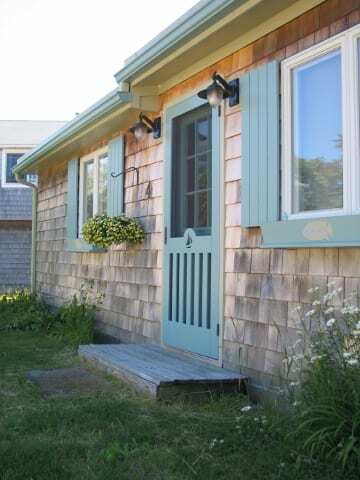 Before” shot shows the front door of a small cottage on a private beach in Gloucester, MA. Sandy loam fills against the house and sill, which needs replacement. 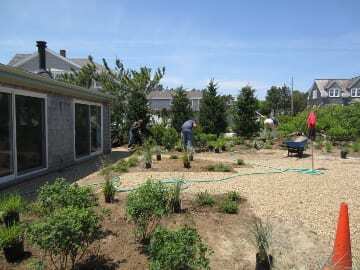 Goal #1: resolve grading problems surrounding the house using vegetated berms on two sides of the house. 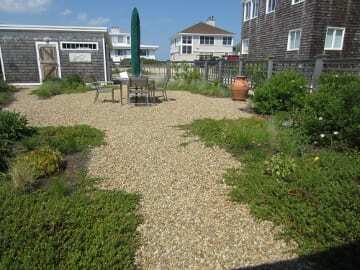 Goal #2: remove the loam and turf, which have no place on the beach. 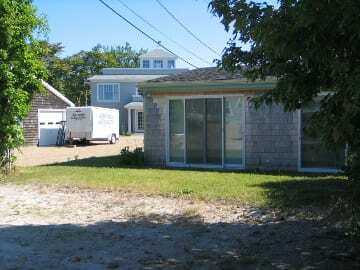 “Before” shot of the northeast side of the cottage showing where the sandy loam did further damage to the structure. The cottage is at left, turf at edge of parking area at the right. 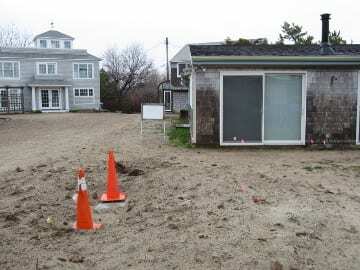 Cones show where a utility pole sat just 12 feet off the corner of the house. It had hosted a tenacious tease of bittersweet. Once maintenance lapsed, the turf grass quickly eliminated itself from the site by dying off. Under construction: view looking out from the sliders, towards the neighboring houses and beach. 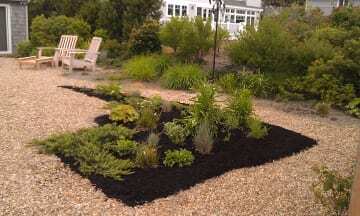 Layout of formally-inspired beds in material largely comprised of existing native sand awaits installation of native plants. I was grateful to work with the talented and experienced crew at Capizzi & Company, Inc. of Acton, MA for this entire project. 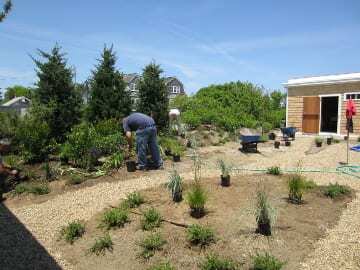 Native plant installation underway: Eastern Red Cedar, Beach Plum, Bayberry, Bearberry, Little Bluestem, Missouri Primrose, Seaside Goldenrod, Carolina Rose and other site-appropriate species. Missouri Primrose emerges the following spring. 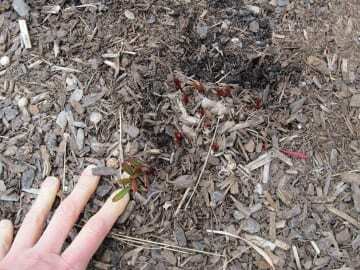 Spring emergence of Little Bluestem. 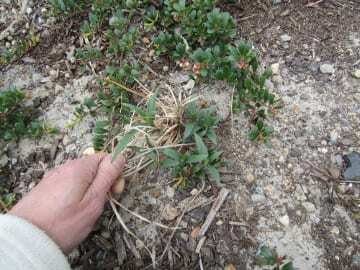 Since wildlife tends to leave Little Bluestem alone, plugs of this species were used as “nurse plants” for other species. We inter-planted the Little Bluestem with smaller numbers of other species that are more attractive to wildlife (Aster oblongifolius, Echinacea purpurea). After losses to wildlife in Year 1, we tried planting three plugs to a hole in Year 2. 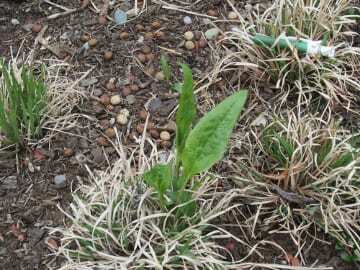 Here we planted two Little Bluestem to one Echinacea. Spring mischief visible in background! Spring tug test: Is it alive? Year 2 saw a good growth spurt. 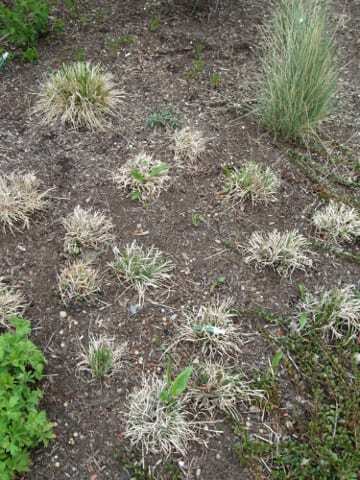 We used leaf mulch selectively and early in the season to help prevent germination of weed species. The leaf matter broke down and was quickly incorporated into the soil. 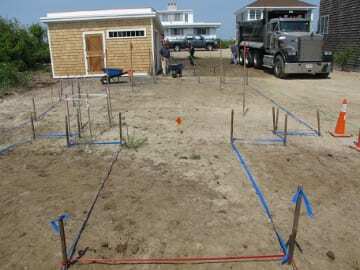 A perimeter fence was designed to sit 12″ minimum above the grade line, to allow for changes in sand elevation. 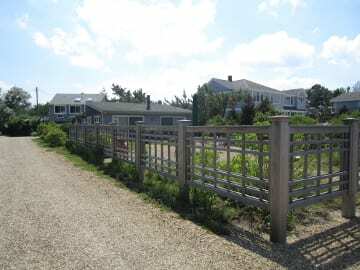 Over 50% opening in the fence panel design allows for passage of strong winds. Wind shear is a challenge on this exposed barrier beach site. As the Bearberry fills in, the formality of the design disappears, but the flow and spatial organization remains. 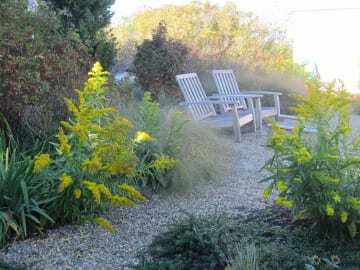 And the winner is: Seaside Goldenrod! Its vigorous growth and sturdy habit resisted strong winds and acted as support for floppier species. The gap below the fence panels disappeared behind the thick growth of the Goldenrod. This resulted in more privacy, but with a spontaneous, “beach-like” feel. The new view from the sliding doors: a private, intimate spot with a clear sense of place. Many thanks to Capizzi & Co, Inc. of Acton, MA & Peter Kelley (builder) of Lexington, MA for their admirable skills, expertise, and their generous support, and to Sylvan Nursery, Van Berkum Nursery, North Creek Nurseries for top-notch plants. And with gratitude for my generous, patient, and open-minded clients, who just love the beach. Laura Kuhn is a self-taught designer, who brought her experiences in theater arts and choreography to the design of outdoor spaces in 1997. After an initial stint in the nursery business, she started her own business in 2000. Laura Kuhn Design Consultation creates custom artistic and wild spaces for private clients in the New England region and beyond. LKDC offers services in landscape design strategy and restoration; project coordination and construction; oversight for urban oases, small parcels, private estate gardens, and rural landscapes; edible gardens; and outdoor dining spaces. Laura’s certifications include MCH, MCLP and NOFA AOLCP. She has served as Advocacy Chair for the Association of Professional Landscape Designers (APLD) and teaches at the Landscape Institute at Boston Architectural College. Reach her through her website.